Chopper just wanted to leave his mark on our special day. 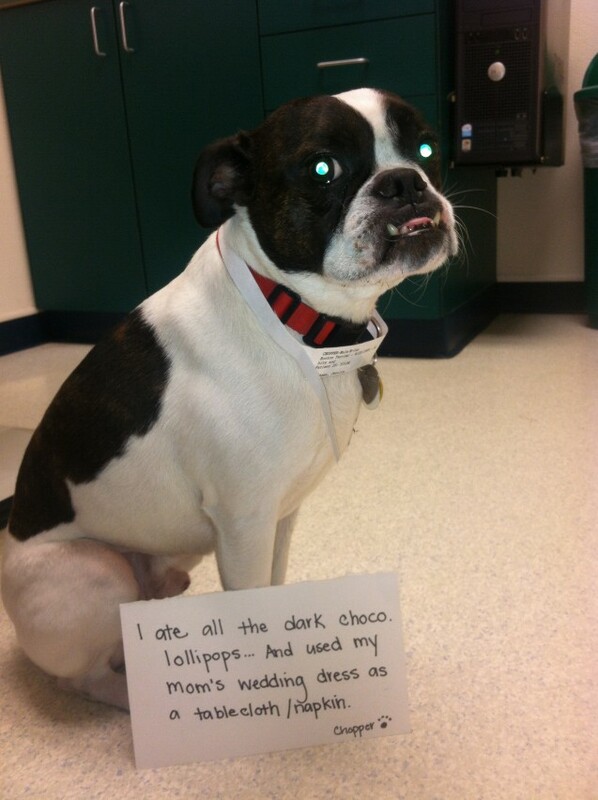 So he got into the leftover wedding favours (dark chocolate lollipops), ate them all, then wiped his adorable chocolate covered face all over his mom’s wedding gown. Now we’re using gift money for vet bills instead of the honeymoon! Really Susan, you want to shame the mommy? You think she had nothing else on her mind? You think she’s not feeling miserable? How do you know they were even carelessly left anywhere? Maybe Chopper is just really clever. My dog can jump on tables and open cabinets and drawers. Maybe Chop is equally talented. Accidents happen! Chopper has wonderful parents that took care of him when he decided to indulge! … Chopper’s mommy is obviously a good mom to him! Accidents happen. I love that you took this picture with his vet tag still on. (Possibly while you were still at the vet’s!) Yucky way to spend a night, but a great shot. Glad eveyone is okay. The fact that the honeymoon was less important than getting her baby to the vet spoke volumes. Chopper, I love your tongue! I hope this occurred after the wedding! …I am laughing. …lollipop duty!! LOL!! My dog got into a half bag of chocolate eggs. ate it all and we didnt even find out til two days later. Never phased her. That dog was a shih tsu and a beast. Poor Chopper! I hope he is okay now. Congratulations to Chopper’s parents. I think it is sweet he was brought to the wedding!!! Usually those who visit dog shaming love dogs and can relate to the people who send in photos. We’re not here to shame the people. I once had a dog that looked JUST like Chopper. Like identical. He was half Cavalier King Charles spaniel and half French Bulldog. I wonder what Chopper is!